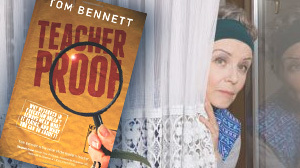 As well as debunking numerous teaching myths, Tom Bennett’s book Teacher Proof reasserts the common view that teaching is a sort of private craft. I disagree. I was not able to attend ResearchEd2013 back in September 2013; but ever since then I have been meaning (and not finding the time) to comment on the outcomes of the conference, which were conscientiously videoed and posted to the web by Leon Cych. The conference was organised by Tom Bennett to highlight the importance of (and problems with) current research in education. This was a few months after he had himself published Teacher Proof, mentioned in my earlier post, Why teachers don’t know best. It struck me that while the attack on quack theories was sound, the conclusions reached in Teacher Proof about the nature of the expertise of teachers were not well justified. Indeed, they seemed to me to be bizarrely at odds with the advertised prospectus of the Research Ed conference. Just as Gutenberg’s printing press provided the means by which the intellectual culture of Europe was transformed, so ed-tech will provide the means to transform our understanding of pedagogy.